A fun and delicious side dish for the whole family. 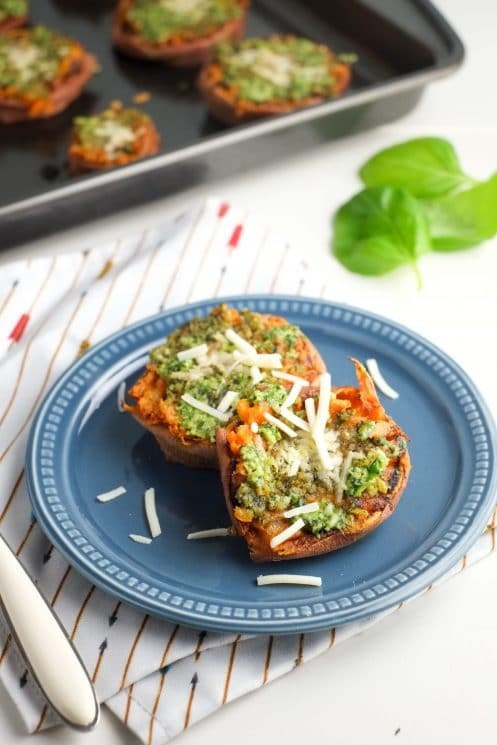 Smashed sweet potatoes are great for little hands to hold and pack in great nutrition, especially with spinach pesto on top! Sometimes you just need a new way to prepare food to bring some enjoyment back into dinnertime. 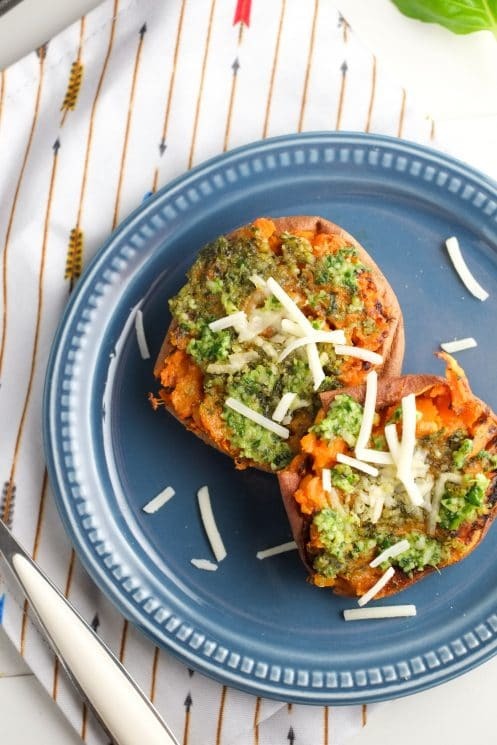 These smashed sweet potatoes are a great way to have some fun – at the dinner table and in the kitchen! Kids can get a kick out of helping in the kitchen – especially when smashing things! 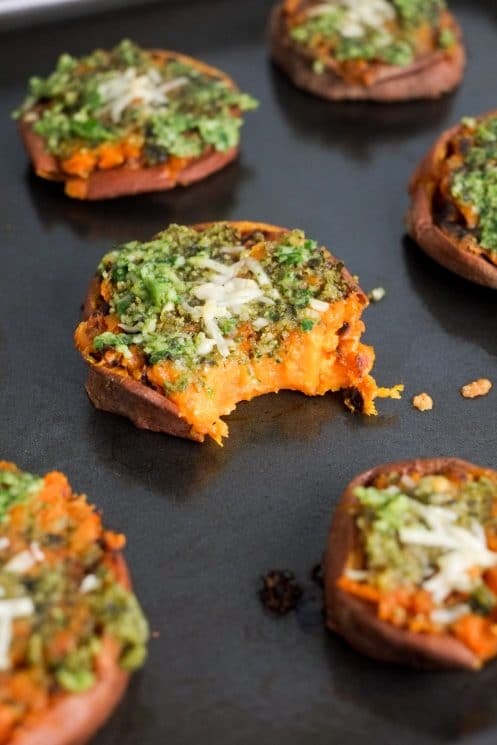 Once cooked and smashed, they’re re-cooked with some pesto on top. Though they look involved, they’re actually super easy. Win-win. 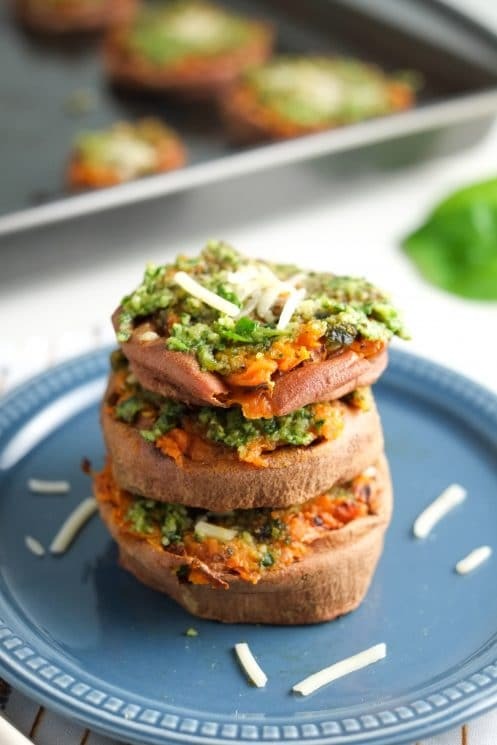 Plus, these smashed sweet potatoes with spinach pesto are actually full of great stuff for your family! Sweet potatoes are packed with beta-carotene, supplying an abundant amount of vitamin A. Not only does beta-carotene act as an antioxidant, once it is converted into vitamin A in our bodies it helps with skin, vision, and our immune system. Who doesn’t want that? Especially for kids! Sweet potatoes are also high in vitamin C, manganese, copper, and several other vitamins and minerals. They’re not only sweeter than standard potatoes, they’re also much better for you. To top them off, we’ve concocted a spinach pesto that helps boost nutrition. Spinach is great for so many reasons, but I especially love that it’s a great source of iron and folate! The pesto also has some walnuts, adding a little protein and some great Omega-3’s. Smashing sweet potatoes is easy! The first step is to wash and cut them. They need to be about an inch thick, evenly sliced. I tried finding the stoutest sweet potatoes I could in order to get wide disks, but even slender ones will work. Once cut, place the sweet potato slices on a greased baking sheet at 425* F for about 30 minutes, until softened. I recommend pouring a tablespoon or two of water into the baking sheet with them, just to help them soften a bit more. Note: If desired, you have the option of boiling the sweet potato slices instead of baking them. Drop them into boiling water for about 20 minutes, or until just softened. Then drain and proceed as with the baked version. Meanwhile, make the pesto! (See below). Once cooked, it’s time to smash! Flip the sweet potatoes over and use a fork or potato masher to smoosh. I didn’t push too hard because I wanted to keep the skin intact, but you can make them as messy as you like. TIP: If kids are helping smash, make sure the sweet potatoes are on a safe surface (not the hot baking sheet) and that they’ve cooled enough to handle without getting burnt. Once smashed, top with pesto and a sprinkle of parmesan cheese. Place back in the oven (still at 425*F) for 5-10 minutes. You’re welcome to use any pesto you like for this recipe, but this spinach pesto is pretty amazing. It not only tastes great, it sneaks in a handful of spinach! Plus, it comes together really easily. 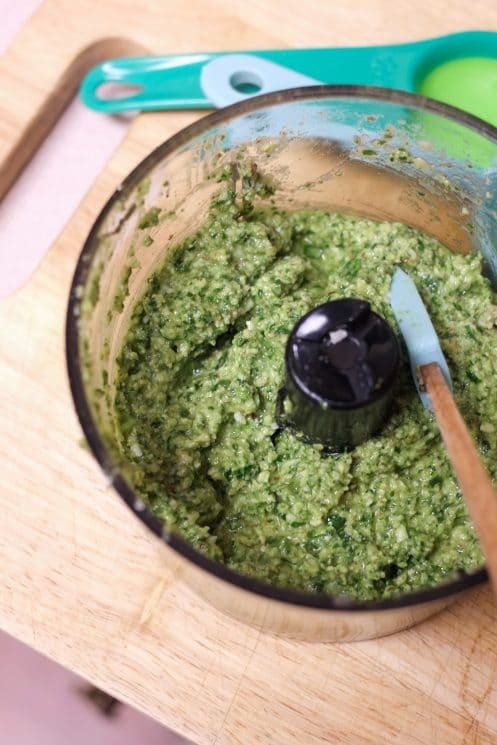 To make the pesto, combine 2 garlic cloves, 1/4 cup walnuts, 1/4 cup parmesan, 3 tablespoons olive oil, 1 tablespoon lemon juice, and 1/4 teaspoon of salt in a food processor. Pulse until well combined. Now add 1/4 cup basil leaves and 1 1/2 cups spinach. Pulse until the leaves are well incorporated into the rest of the mixture. You’ll likely have extra left over (yay!). This can be stored in an airtight container in the fridge for around 4 days. Use it on pasta, chicken, or sandwiches. 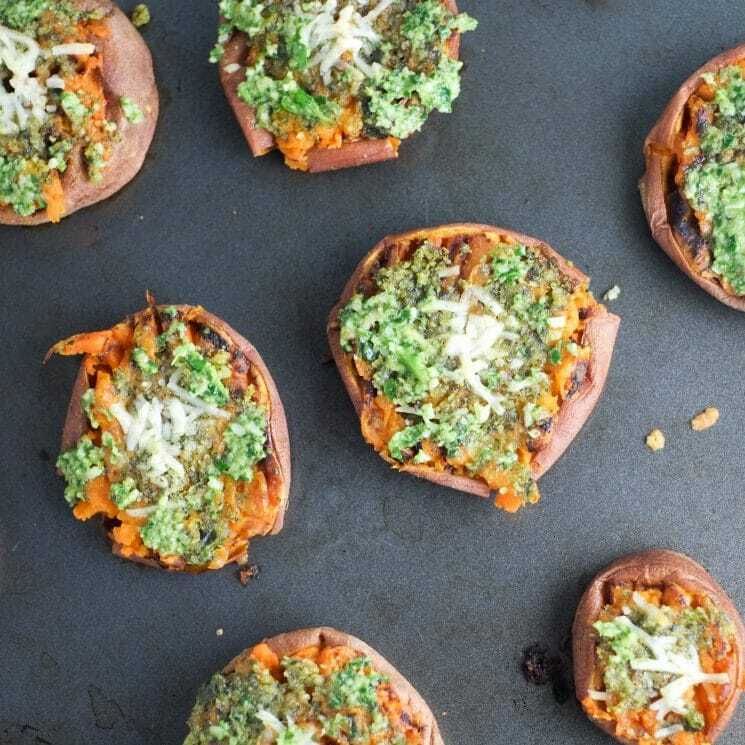 We hope these smashed sweet potatoes are a smashing success with your family! Preheat oven to 425* F. Grease a large rimmed baking sheet. Wash sweet potatoes, scrubbing skin well. Cut into 1-inch slices and place on the prepared baking sheet. Pour a few tablespoons of water into the baking sheet, then place into the oven. Bake for 30 minutes, until sweet potatoes are soft. Meanwhile, make the pesto: use a food processor to combine walnuts, 1/4 cup parmesan, olive oil, garlic cloves, lemon juice, and salt. Pulse until well-combined. Then add basil leaves and spinach and pulse again until a pesto is formed. 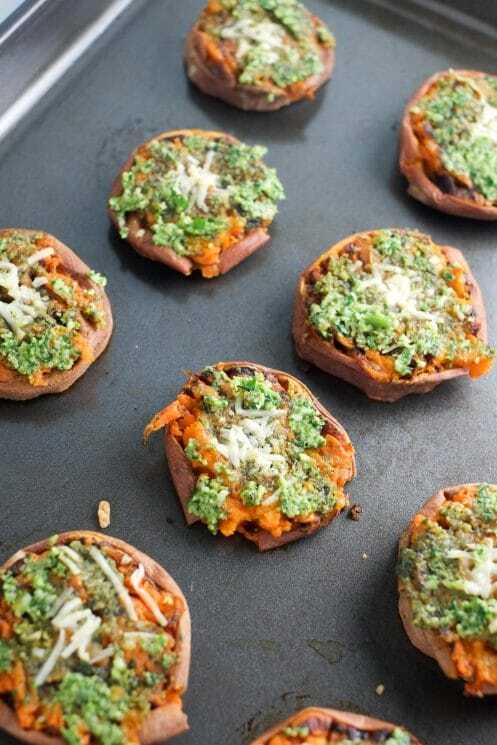 Remove sweet potato rounds from the oven, flip them over, and smash with a fork or potato masher. 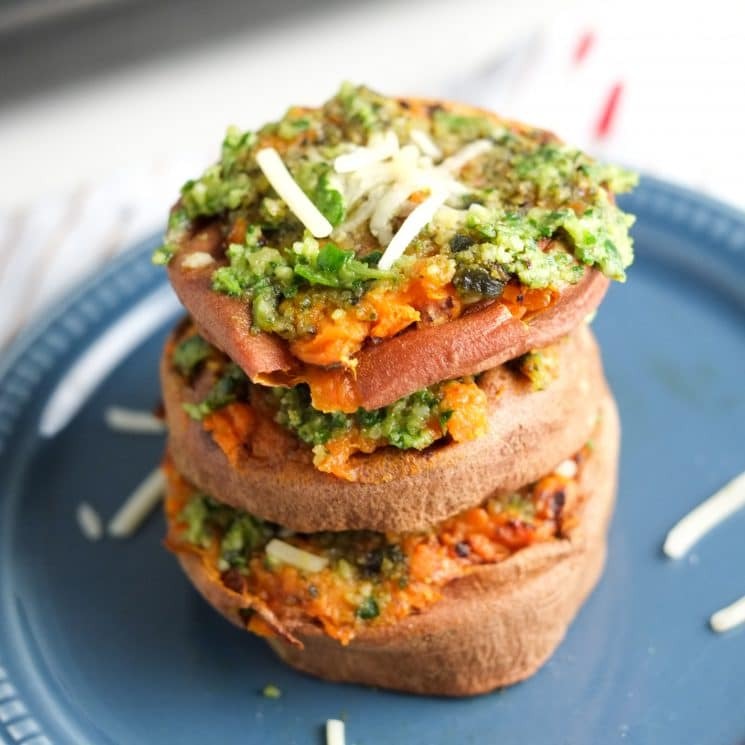 Spread each smashed sweet potato with a spoonful of pesto, then sprinkle a little extra parmesan cheese on top, if desired. Place the sweet potatoes back into the oven (still at 425*F) and bake for 5-10 minutes. This looks so delicious. I’ll try do it. Thanks for sharing! If served as a side, probably around 4 people. Sweet potatoes vary in size too so it’s not an exact science, but that’s my best estimation! What a yummy recipe! 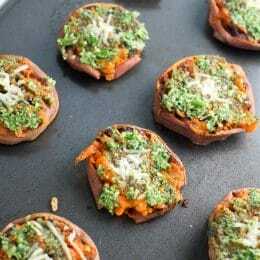 I boiled the sweet potatoes and used some sunflower seeds in the pesto along with shredded cheddar cheese. (I didn’t have any walnuts or parmesan on hand). I also used a mix of arugula and spinach. It’s a very forgiving dish. It tastes great despite the tweaks.